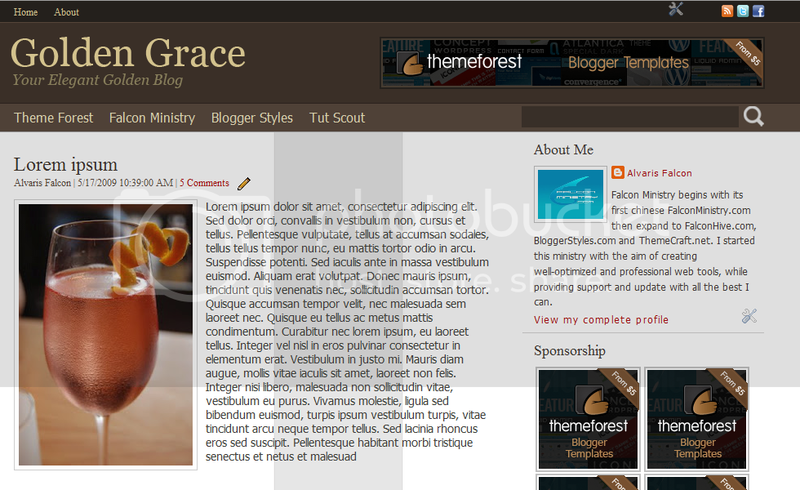 Golden Grace is a clean and professional Blogger template designed for blogger who needs a clean and professional environment to present content. Header Navigation Menu- Create your own navigation menu that links to anywhere. Social Network Link Section- Show at least 3 of your social network link beside the page menu. Header’s PSD file for customization- Create your own header title or logo. 468×60 Ads Gadget- Place your 468×60 ads including Google Adsense ads beside the header. 125×125 Ads Gadget- Place your 125×125 ads including Google Adsense ads in the sidebar, unlimited ads space. Flickr Show Gadget- Show your own Flickr’s image/ photostream. Jump Link feature- Show your preferred post content in the home page. SEO Friendly- Optimized template for your better SEO startup. Bonus: Add more social network icons into your social network link section. For any template issue, you can leave a comment (recommended) or contact us through alvaris924@gmail.com. We would try our best to answer your comment within 3 business days. First of all, click this link to confirm if you’re the victim of this issue. 6. Click ‘Save Template’ to save the template and congrats, you did it! I’m currently submitting the latest version of the template that solves this issue to the ThemeForest, and I will announce the approval once the theme is approved.